The consultation is informal and I aim to help children feel at ease. I have many years of experience dealing with young children – including three of my own! I will test the child’s vision using an appropriate method for their age and then carry out an assessment to test for squint, lazy eye, 3D vision and a complete eye examination. It is usually necessary to instil some drops to widen the pupil in order to assess the child’s requirement for glasses. Obviously, children may not be too keen on this, but it is an important part of the examination. As these drops sting a little, I use a numbing drop first. The drops take about 20 minutes to take effect and will blur the child’s vision for reading for 3-4 hours and he or she may also become more sensitive to light. If your child does need further review, this part usually does not need repeating at every visit. Children's reach visual maturity - when the most rapid growth changes finish - at about 7½ years of age. If your child has a squint (misalignment of the eyes) or amblyopia (lazy eye), it is usually necessary to see the child every 3-6 months. I work in partnership with a team of orthoptists, one of whom (Anne Hitchcock DBO) also works with me in my private practice. 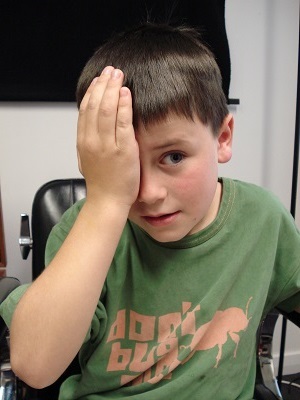 Orthoptists are specially trained in assessing how well the eyes are used together. 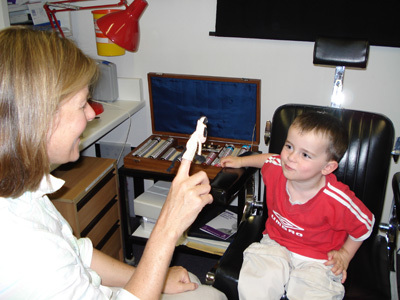 If your child needs to wear glasses or have occlusion (patching) treatment for a lazy eye, one of the orthoptists will be reviewing him or her regularly to assess how well the treatment is working and to advise and support you and your child.